MB specification 325.0. Blue color. Do NOT mix yellow and blue coolant. Replaces Q1030002. If this is not the exact Engine Coolant Antifreeze (1 Gallon) you are looking for, or you would like this part in a brand other than Genuine Mercedes, please contact us and one of our customer service experts will help you locate the exact part you need. 190D 2.2 - 2.2L 4 Cyl (8 Valve) - Diesel MBZ Approval: 325.0 Concentrate. For distilled water see part # 55 7864 010. 190D 2.5 - 2.5L 5 Cyl (10 Valve) - Diesel MBZ Approval: 325.0 Concentrate. For distilled water see part # 55 7864 010. 190D 2.5 Turbo - 2.5L 5 Cyl (10 Valve) - Turbo Diesel MBZ Approval: 325.0 Concentrate. For distilled water see part # 55 7864 010. 190E 2.3 - 2.3L 4 Cyl (8 Valve) MBZ Approval: 325.0 Concentrate. For distilled water see part # 55 7864 010. 190E 2.3-16 - 2.3L 4 Cyl (16 Valve) MBZ Approval: 325.0 Concentrate. For distilled water see part # 55 7864 010. 190E 2.6 - 2.6L 6 Cyl (12 Valve) MBZ Approval: 325.0 Concentrate. For distilled water see part # 55 7864 010. 230 - 2.3L 4 Cyl (8 Valve) MBZ Approval: 325.0 Concentrate. For distilled water see part # 55 7864 010. 240D - 2.4L 4 Cyl (8 Valve) - Diesel MBZ Approval: 325.0 Concentrate. For distilled water see part # 55 7864 010. 260E - 2.6L 6 Cyl (12 Valve) MBZ Approval: 325.0 Concentrate. For distilled water see part # 55 7864 010. 280CE - 2.8L 6 Cyl (12 Valve) MBZ Approval: 325.0 Concentrate. For distilled water see part # 55 7864 010. 280E - 2.8L 6 Cyl (12 Valve) MBZ Approval: 325.0 Concentrate. For distilled water see part # 55 7864 010. 280S - 2.8L 6 Cyl (12 Valve) MBZ Approval: 325.0 Concentrate. For distilled water see part # 55 7864 010. 280SE - 2.8L 6 Cyl (12 Valve) MBZ Approval: 325.0 Concentrate. For distilled water see part # 55 7864 010. 300CD - 3.0L 5 Cyl (10 Valve) - Diesel MBZ Approval: 325.0 Concentrate. For distilled water see part # 55 7864 010. 300CD - 3.0L 5 Cyl (10 Valve) - Turbo Diesel MBZ Approval: 325.0 Concentrate. For distilled water see part # 55 7864 010. 300CE - 3.0L 6 Cyl (12 Valve) MBZ Approval: 325.0 Concentrate. For distilled water see part # 55 7864 010. 300CE - 3.0L 6 Cyl (24 Valve) MBZ Approval: 325.0 Concentrate. For distilled water see part # 55 7864 010. 300CE - Convertible - 3.2L 6 Cyl (24 Valve) MBZ Approval: 325.0 Concentrate. For distilled water see part # 55 7864 010. 300CE - Coupe - 3.2L 6 Cyl (24 Valve) MBZ Approval: 325.0 Concentrate. For distilled water see part # 55 7864 010. 300D - 3.0L 5 Cyl (10 Valve) - Diesel MBZ Approval: 325.0 Concentrate. For distilled water see part # 55 7864 010. 300D - 3.0L 5 Cyl (10 Valve) - Turbo Diesel MBZ Approval: 325.0 Concentrate. For distilled water see part # 55 7864 010. 300D - 3.0L 6 Cyl (12 Valve) - Turbo Diesel MBZ Approval: 325.0 Concentrate. For distilled water see part # 55 7864 010. 300D 2.5 - 2.5L 5 Cyl (10 Valve) - Turbo Diesel MBZ Approval: 325.0 Concentrate. For distilled water see part # 55 7864 010. 300E - 3.0L 6 Cyl (12 Valve) MBZ Approval: 325.0 Concentrate. For distilled water see part # 55 7864 010. 300E 2.6 - 2.6L 6 Cyl (12 Valve) MBZ Approval: 325.0 Concentrate. For distilled water see part # 55 7864 010. 300E 4Matic - 3.0L 6 Cyl (12 Valve) MBZ Approval: 325.0 Concentrate. For distilled water see part # 55 7864 010. 300E - 3.2L 6 Cyl (24 Valve) MBZ Approval: 325.0 Concentrate. For distilled water see part # 55 7864 010. 300E 2.8 - 2.8L 6 Cyl (24 Valve) MBZ Approval: 325.0 Concentrate. For distilled water see part # 55 7864 010. 300SD - 3.0L 5 Cyl (10 Valve) - Turbo Diesel MBZ Approval: 325.0 Concentrate. For distilled water see part # 55 7864 010. 300SD - 3.4L 6 Cyl (12 Valve) - Turbo Diesel MBZ Approval: 325.0 Concentrate. For distilled water see part # 55 7864 010. 300SDL - 3.0L 6 Cyl (12 Valve) - Turbo Diesel MBZ Approval: 325.0 Concentrate. For distilled water see part # 55 7864 010. 300SE - 3.0L 6 Cyl (12 Valve) MBZ Approval: 325.0 Concentrate. For distilled water see part # 55 7864 010. 300SE - 3.2L 6 Cyl (24 Valve) MBZ Approval: 325.0 Concentrate. For distilled water see part # 55 7864 010. 300SEL - 3.0L 6 Cyl (12 Valve) MBZ Approval: 325.0 Concentrate. For distilled water see part # 55 7864 010. 300SL - 3.0L 6 Cyl (24 Valve) MBZ Approval: 325.0 Concentrate. For distilled water see part # 55 7864 010. 300TD - 3.0L 5 Cyl (10 Valve) - Diesel MBZ Approval: 325.0 Concentrate. For distilled water see part # 55 7864 010. 300TD - 3.0L 5 Cyl (10 Valve) - Turbo Diesel MBZ Approval: 325.0 Concentrate. For distilled water see part # 55 7864 010. 300TD - 3.0L 6 Cyl (12 Valve) - Turbo Diesel MBZ Approval: 325.0 Concentrate. For distilled water see part # 55 7864 010. 300TE - 3.0L 6 Cyl (12 Valve) MBZ Approval: 325.0 Concentrate. For distilled water see part # 55 7864 010. 300TE 4Matic - 3.0L 6 Cyl (12 Valve) MBZ Approval: 325.0 Concentrate. For distilled water see part # 55 7864 010. 300TE - 3.2L 6 Cyl (24 Valve) MBZ Approval: 325.0 Concentrate. For distilled water see part # 55 7864 010. 350SD - 3.4L 6 Cyl (12 Valve) - Turbo Diesel MBZ Approval: 325.0 Concentrate. For distilled water see part # 55 7864 010. 350SDL - 3.4L 6 Cyl (12 Valve) - Turbo Diesel MBZ Approval: 325.0 Concentrate. For distilled water see part # 55 7864 010. 380SE - 3.8L 8 Cyl (16 Valve) MBZ Approval: 325.0 Concentrate. For distilled water see part # 55 7864 010. 380SEC - 3.8L 8 Cyl (16 Valve) MBZ Approval: 325.0 Concentrate. For distilled water see part # 55 7864 010. 380SEL - 3.8L 8 Cyl (16 Valve) MBZ Approval: 325.0 Concentrate. For distilled water see part # 55 7864 010. 380SL - 3.8L 8 Cyl (16 Valve) MBZ Approval: 325.0 Concentrate. For distilled water see part # 55 7864 010. 380SLC - 3.8L 8 Cyl (16 Valve) MBZ Approval: 325.0 Concentrate. For distilled water see part # 55 7864 010. 400E - 4.2L 8 Cyl (32 Valve) MBZ Approval: 325.0 Concentrate. For distilled water see part # 55 7864 010. 400SE - 4.2L 8 Cyl (32 Valve) MBZ Approval: 325.0 Concentrate. For distilled water see part # 55 7864 010. 400SEL - 4.2L 8 Cyl (32 Valve) MBZ Approval: 325.0 Concentrate. For distilled water see part # 55 7864 010. 420SEL - 4.2L 8 Cyl (16 Valve) MBZ Approval: 325.0 Concentrate. For distilled water see part # 55 7864 010. 450SE - 4.5L 8 Cyl (16 Valve) MBZ Approval: 325.0 Concentrate. For distilled water see part # 55 7864 010. 450SEL - 4.5L 8 Cyl (16 Valve) MBZ Approval: 325.0 Concentrate. For distilled water see part # 55 7864 010. 450SEL 6.9 - 6.8L 8 Cyl (16 Valve) MBZ Approval: 325.0 Concentrate. For distilled water see part # 55 7864 010. 450SL - 4.5L 8 Cyl (16 Valve) MBZ Approval: 325.0 Concentrate. For distilled water see part # 55 7864 010. 450SLC - 4.5L 8 Cyl (16 Valve) MBZ Approval: 325.0 Concentrate. For distilled water see part # 55 7864 010. 500E - 5.0L 8 Cyl (32 Valve) MBZ Approval: 325.0 Concentrate. For distilled water see part # 55 7864 010. 500SEC - 5.0L 8 Cyl (16 Valve) MBZ Approval: 325.0 Concentrate. For distilled water see part # 55 7864 010. 500SEC - 5.0L 8 Cyl (32 Valve) MBZ Approval: 325.0 Concentrate. For distilled water see part # 55 7864 010. 500SEL - 5.0L 8 Cyl (16 Valve) MBZ Approval: 325.0 Concentrate. For distilled water see part # 55 7864 010. 500SEL - 5.0L 8 Cyl (32 Valve) MBZ Approval: 325.0 Concentrate. For distilled water see part # 55 7864 010. 500SL - 5.0L 8 Cyl (32 Valve) MBZ Approval: 325.0 Concentrate. For distilled water see part # 55 7864 010. 560SEC - 5.6L 8 Cyl (16 Valve) MBZ Approval: 325.0 Concentrate. For distilled water see part # 55 7864 010. 560SEL - 5.6L 8 Cyl (16 Valve) MBZ Approval: 325.0 Concentrate. For distilled water see part # 55 7864 010. 560SL - 5.6L 8 Cyl (16 Valve) MBZ Approval: 325.0 Concentrate. For distilled water see part # 55 7864 010. 600SEC - 6.0L 12 Cyl (48 Valve) MBZ Approval: 325.0 Concentrate. For distilled water see part # 55 7864 010. 600SEL - 6.0L 12 Cyl (48 Valve) MBZ Approval: 325.0 Concentrate. For distilled water see part # 55 7864 010. 600SL - 6.0L 12 Cyl (48 Valve) MBZ Approval: 325.0 Concentrate. For distilled water see part # 55 7864 010. C220 - 2.2L 4 Cyl (16 Valve) MBZ Approval: 325.0 Concentrate. For distilled water see part # 55 7864 010. C230 - 2.3L 4 Cyl (16 Valve) MBZ Approval: 325.0 Concentrate. For distilled water see part # 55 7864 010. C230 Kompressor - 2.3L 4 Cyl (16 Valve) MBZ Approval: 325.0 Concentrate. For distilled water see part # 55 7864 010. C230 Kompressor - 1.8L 4 Cyl (16 Valve) MBZ Approval: 325.0 Concentrate. For distilled water see part # 55 7864 010. C230 Kompressor - Coupe - 1.8L 4 Cyl (16 Valve) MBZ Approval: 325.0 Concentrate. For distilled water see part # 55 7864 010. C230 Sport - 2.5L 6 Cyl (24 Valve) MBZ Approval: 325.0 Concentrate. For distilled water see part # 55 7864 010. C240 - 2.6L 6 Cyl (18 Valve) MBZ Approval: 325.0 Concentrate. For distilled water see part # 55 7864 010. C240 - Wagon - 2.6L 6 Cyl (18 Valve) MBZ Approval: 325.0 Concentrate. For distilled water see part # 55 7864 010. C240 4Matic - 2.6L 6 Cyl (18 Valve) MBZ Approval: 325.0 Concentrate. For distilled water see part # 55 7864 010. C240 4Matic - Wagon - 2.6L 6 Cyl (18 Valve) MBZ Approval: 325.0 Concentrate. For distilled water see part # 55 7864 010. C250 - 1.8L 4 Cyl (16 Valve) - Turbo MBZ Approval: 325.0 Concentrate. For distilled water see part # 55 7864 010. C250 Luxury - 1.8L 4 Cyl (16 Valve) - Turbo MBZ Approval: 325.0 Concentrate. For distilled water see part # 55 7864 010. C250 Sport - 1.8L 4 Cyl (16 Valve) - Turbo MBZ Approval: 325.0 Concentrate. For distilled water see part # 55 7864 010. C280 - 2.8L 6 Cyl (24 Valve) MBZ Approval: 325.0 Concentrate. For distilled water see part # 55 7864 010. C280 - 2.8L 6 Cyl (18 Valve) MBZ Approval: 325.0 Concentrate. For distilled water see part # 55 7864 010. C280 4Matic - 3.0L 6 Cyl (24 Valve) MBZ Approval: 325.0 Concentrate. For distilled water see part # 55 7864 010. C280 Luxury - 3.0L 6 Cyl (24 Valve) MBZ Approval: 325.0 Concentrate. For distilled water see part # 55 7864 010. C300 4Matic Luxury - 3.0L 6 Cyl (24 Valve) MBZ Approval: 325.0 Concentrate. For distilled water see part # 55 7864 010. C300 4Matic Sport - 3.0L 6 Cyl (24 Valve) MBZ Approval: 325.0 Concentrate. For distilled water see part # 55 7864 010. C300 Luxury - 3.0L 6 Cyl (24 Valve) MBZ Approval: 325.0 Concentrate. For distilled water see part # 55 7864 010. C300 Sport - 3.0L 6 Cyl (24 Valve) MBZ Approval: 325.0 Concentrate. For distilled water see part # 55 7864 010. C300 4Matic Luxury - 3.5L 6 Cyl (24 Valve) MBZ Approval: 325.0 Concentrate. For distilled water see part # 55 7864 010. C300 4Matic Sport - 3.5L 6 Cyl (24 Valve) MBZ Approval: 325.0 Concentrate. For distilled water see part # 55 7864 010. C32 AMG - 3.2L 6 Cyl (18 Valve) MBZ Approval: 325.0 Concentrate. For distilled water see part # 55 7864 010. C320 - 3.2L 6 Cyl (18 Valve) MBZ Approval: 325.0 Concentrate. For distilled water see part # 55 7864 010. C320 - Wagon - 3.2L 6 Cyl (18 Valve) MBZ Approval: 325.0 Concentrate. For distilled water see part # 55 7864 010. C320 - Coupe - 3.2L 6 Cyl (18 Valve) MBZ Approval: 325.0 Concentrate. For distilled water see part # 55 7864 010. C320 4Matic - 3.2L 6 Cyl (18 Valve) MBZ Approval: 325.0 Concentrate. For distilled water see part # 55 7864 010. C320 4Matic - Wagon - 3.2L 6 Cyl (18 Valve) MBZ Approval: 325.0 Concentrate. For distilled water see part # 55 7864 010. C350 4Matic - 3.5L 6 Cyl (24 Valve) MBZ Approval: 325.0 Concentrate. For distilled water see part # 55 7864 010. C350 Luxury - 3.5L 6 Cyl (24 Valve) MBZ Approval: 325.0 Concentrate. For distilled water see part # 55 7864 010. C350 Sport - 3.5L 6 Cyl (24 Valve) MBZ Approval: 325.0 Concentrate. For distilled water see part # 55 7864 010. C350 - 3.5L 6 Cyl (24 Valve) MBZ Approval: 325.0 Concentrate. For distilled water see part # 55 7864 010. C36 AMG - 3.6L 6 Cyl (24 Valve) MBZ Approval: 325.0 Concentrate. For distilled water see part # 55 7864 010. C43 AMG - 4.3L 8 Cyl (24 Valve) MBZ Approval: 325.0 Concentrate. For distilled water see part # 55 7864 010. C55 AMG - 5.5L 8 Cyl (24 Valve) MBZ Approval: 325.0 Concentrate. For distilled water see part # 55 7864 010. C63 AMG - 6.3L 8 Cyl (32 Valve) MBZ Approval: 325.0 Concentrate. For distilled water see part # 55 7864 010. C63 AMG - Coupe - 6.3L 8 Cyl (32 Valve) MBZ Approval: 325.0 Concentrate. For distilled water see part # 55 7864 010. C63 AMG Black Series - 6.3L 8 Cyl (32 Valve) MBZ Approval: 325.0 Concentrate. For distilled water see part # 55 7864 010. C63 AMG - Sedan - 6.3L 8 Cyl (32 Valve) MBZ Approval: 325.0 Concentrate. For distilled water see part # 55 7864 010. CL500 - 5.0L 8 Cyl (32 Valve) MBZ Approval: 325.0 Concentrate. For distilled water see part # 55 7864 010. CL500 - 5.0L 8 Cyl (24 Valve) MBZ Approval: 325.0 Concentrate. For distilled water see part # 55 7864 010. CL55 AMG - 5.5L 8 Cyl (24 Valve) MBZ Approval: 325.0 Concentrate. For distilled water see part # 55 7864 010. CL550 - 5.5L 8 Cyl (32 Valve) MBZ Approval: 325.0 Concentrate. For distilled water see part # 55 7864 010. CL550 4Matic - 5.5L 8 Cyl (32 Valve) MBZ Approval: 325.0 Concentrate. For distilled water see part # 55 7864 010. CL550 4Matic - 4.6L 8 Cyl (32 Valve) - Turbo MBZ Approval: 325.0 Concentrate. For distilled water see part # 55 7864 010. CL600 - 6.0L 12 Cyl (48 Valve) MBZ Approval: 325.0 Concentrate. For distilled water see part # 55 7864 010. CL600 - 5.8L 12 Cyl (36 Valve) MBZ Approval: 325.0 Concentrate. For distilled water see part # 55 7864 010. CL600 - 5.5L 12 Cyl (36 Valve) - Turbo MBZ Approval: 325.0 Concentrate. For distilled water see part # 55 7864 010. CL63 AMG - 6.3L 8 Cyl (32 Valve) MBZ Approval: 325.0 Concentrate. For distilled water see part # 55 7864 010. CL63 AMG - 5.5L 8 Cyl (32 Valve) - Turbo MBZ Approval: 325.0 Concentrate. For distilled water see part # 55 7864 010. CL65 AMG - 6.0L 12 Cyl (36 Valve) - Turbo MBZ Approval: 325.0 Concentrate. For distilled water see part # 55 7864 010. CLA250 - 2.0L 4 Cyl (16 Valve) - Turbo MBZ Approval: 325.0 Concentrate. For distilled water see part # 55 7864 010. CLA250 4Matic - 2.0L 4 Cyl (16 Valve) - Turbo MBZ Approval: 325.0 Concentrate. For distilled water see part # 55 7864 010. CLA45 AMG 4Matic - 2.0L 4 Cyl (16 Valve) - Turbo MBZ Approval: 325.0 Concentrate. For distilled water see part # 55 7864 010. CLK320 - 3.2L 6 Cyl (18 Valve) MBZ Approval: 325.0 Concentrate. For distilled water see part # 55 7864 010. CLK320 - Convertible - 3.2L 6 Cyl (18 Valve) MBZ Approval: 325.0 Concentrate. For distilled water see part # 55 7864 010. CLK320 - Coupe - 3.2L 6 Cyl (18 Valve) MBZ Approval: 325.0 Concentrate. For distilled water see part # 55 7864 010. CLK350 - Convertible - 3.5L 6 Cyl (24 Valve) MBZ Approval: 325.0 Concentrate. For distilled water see part # 55 7864 010. CLK350 - Coupe - 3.5L 6 Cyl (24 Valve) MBZ Approval: 325.0 Concentrate. For distilled water see part # 55 7864 010. CLK430 - 4.3L 8 Cyl (24 Valve) MBZ Approval: 325.0 Concentrate. For distilled water see part # 55 7864 010. CLK430 - Convertible - 4.3L 8 Cyl (24 Valve) MBZ Approval: 325.0 Concentrate. For distilled water see part # 55 7864 010. CLK430 - Coupe - 4.3L 8 Cyl (24 Valve) MBZ Approval: 325.0 Concentrate. For distilled water see part # 55 7864 010. CLK500 - 5.0L 8 Cyl (24 Valve) MBZ Approval: 325.0 Concentrate. For distilled water see part # 55 7864 010. CLK500 - Convertible - 5.0L 8 Cyl (24 Valve) MBZ Approval: 325.0 Concentrate. For distilled water see part # 55 7864 010. CLK500 - Coupe - 5.0L 8 Cyl (24 Valve) MBZ Approval: 325.0 Concentrate. For distilled water see part # 55 7864 010. CLK55 AMG - 5.5L 8 Cyl (24 Valve) MBZ Approval: 325.0 Concentrate. For distilled water see part # 55 7864 010. CLK55 AMG - Convertible - 5.5L 8 Cyl (24 Valve) MBZ Approval: 325.0 Concentrate. For distilled water see part # 55 7864 010. CLK55 AMG - Coupe - 5.5L 8 Cyl (24 Valve) MBZ Approval: 325.0 Concentrate. For distilled water see part # 55 7864 010. CLK550 - Convertible - 5.5L 8 Cyl (32 Valve) MBZ Approval: 325.0 Concentrate. For distilled water see part # 55 7864 010. CLK550 - Coupe - 5.5L 8 Cyl (32 Valve) MBZ Approval: 325.0 Concentrate. For distilled water see part # 55 7864 010. CLK63 AMG - 6.3L 8 Cyl (32 Valve) MBZ Approval: 325.0 Concentrate. For distilled water see part # 55 7864 010. CLK63 AMG Black Series - 6.3L 8 Cyl (32 Valve) MBZ Approval: 325.0 Concentrate. For distilled water see part # 55 7864 010. CLS500 - 5.0L 8 Cyl (24 Valve) MBZ Approval: 325.0 Concentrate. For distilled water see part # 55 7864 010. CLS55 AMG - 5.5L 8 Cyl (24 Valve) MBZ Approval: 325.0 Concentrate. For distilled water see part # 55 7864 010. CLS550 - 5.5L 8 Cyl (32 Valve) MBZ Approval: 325.0 Concentrate. For distilled water see part # 55 7864 010. CLS550 - 4.6L 8 Cyl (32 Valve) - Turbo MBZ Approval: 325.0 Concentrate. For distilled water see part # 55 7864 010. CLS550 4Matic - 4.6L 8 Cyl (32 Valve) - Turbo MBZ Approval: 325.0 Concentrate. For distilled water see part # 55 7864 010. CLS63 AMG - 6.3L 8 Cyl (32 Valve) MBZ Approval: 325.0 Concentrate. For distilled water see part # 55 7864 010. CLS63 AMG - 5.5L 8 Cyl (32 Valve) - Turbo MBZ Approval: 325.0 Concentrate. For distilled water see part # 55 7864 010. CLS63 AMG 4Matic - 5.5L 8 Cyl (32 Valve) - Turbo MBZ Approval: 325.0 Concentrate. For distilled water see part # 55 7864 010. CLS63 AMG S 4Matic - 5.5L 8 Cyl (32 Valve) - Turbo MBZ Approval: 325.0 Concentrate. For distilled water see part # 55 7864 010. E250 Bluetec - 2.1L 4 Cyl (16 Valve) - Turbo Diesel MBZ Approval: 325.0 Concentrate. For distilled water see part # 55 7864 010. E250 Bluetec 4Matic - 2.1L 4 Cyl (16 Valve) - Turbo Diesel MBZ Approval: 325.0 Concentrate. For distilled water see part # 55 7864 010. E300 - 3.0L 6 Cyl (24 Valve) - Diesel MBZ Approval: 325.0 Concentrate. For distilled water see part # 55 7864 010. E300 - 3.0L 6 Cyl (24 Valve) - Turbo Diesel MBZ Approval: 325.0 Concentrate. For distilled water see part # 55 7864 010. E320 - 3.2L 6 Cyl (24 Valve) MBZ Approval: 325.0 Concentrate. For distilled water see part # 55 7864 010. E320 - Convertible - 3.2L 6 Cyl (24 Valve) MBZ Approval: 325.0 Concentrate. For distilled water see part # 55 7864 010. E320 - Coupe - 3.2L 6 Cyl (24 Valve) MBZ Approval: 325.0 Concentrate. For distilled water see part # 55 7864 010. E320 - Wagon - 3.2L 6 Cyl (24 Valve) MBZ Approval: 325.0 Concentrate. For distilled water see part # 55 7864 010. E320 - 3.2L 6 Cyl (18 Valve) MBZ Approval: 325.0 Concentrate. For distilled water see part # 55 7864 010. E320 - Wagon - 3.2L 6 Cyl (18 Valve) MBZ Approval: 325.0 Concentrate. For distilled water see part # 55 7864 010. E320 4Matic - 3.2L 6 Cyl (18 Valve) MBZ Approval: 325.0 Concentrate. For distilled water see part # 55 7864 010. E320 4Matic - Wagon - 3.2L 6 Cyl (18 Valve) MBZ Approval: 325.0 Concentrate. For distilled water see part # 55 7864 010. E320 CDI - 3.2L 6 Cyl (24 Valve) - Turbo Diesel MBZ Approval: 325.0 Concentrate. For distilled water see part # 55 7864 010. E320 Bluetec - 3.0L 6 Cyl (24 Valve) - Turbo Diesel MBZ Approval: 325.0 Concentrate. For distilled water see part # 55 7864 010. E350 - 3.5L 6 Cyl (24 Valve) MBZ Approval: 325.0 Concentrate. For distilled water see part # 55 7864 010. 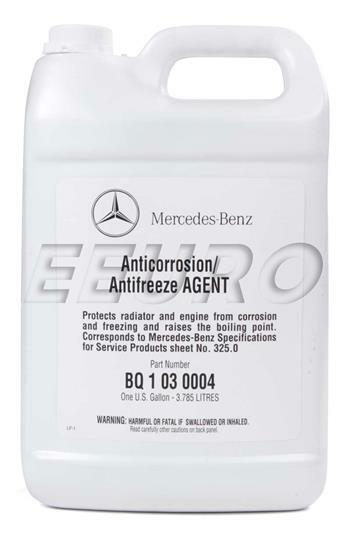 E350 4Matic - 3.5L 6 Cyl (24 Valve) MBZ Approval: 325.0 Concentrate. For distilled water see part # 55 7864 010. E350 4Matic - Wagon - 3.5L 6 Cyl (24 Valve) MBZ Approval: 325.0 Concentrate. For distilled water see part # 55 7864 010. E350 - Coupe - 3.5L 6 Cyl (24 Valve) MBZ Approval: 325.0 Concentrate. For distilled water see part # 55 7864 010. E350 - Convertible - 3.5L 6 Cyl (24 Valve) MBZ Approval: 325.0 Concentrate. For distilled water see part # 55 7864 010. E350 Bluetec - 3.0L 6 Cyl (24 Valve) - Turbo Diesel MBZ Approval: 325.0 Concentrate. For distilled water see part # 55 7864 010. E350 4Matic - Coupe - 3.5L 6 Cyl (24 Valve) MBZ Approval: 325.0 Concentrate. For distilled water see part # 55 7864 010. E400 Hybrid - 3.5L 6 Cyl (24 Valve) MBZ Approval: 325.0 Concentrate. For distilled water see part # 55 7864 010. E420 - 4.2L 8 Cyl (32 Valve) MBZ Approval: 325.0 Concentrate. For distilled water see part # 55 7864 010. E430 - 4.3L 8 Cyl (24 Valve) MBZ Approval: 325.0 Concentrate. For distilled water see part # 55 7864 010. E430 4Matic - 4.3L 8 Cyl (24 Valve) MBZ Approval: 325.0 Concentrate. For distilled water see part # 55 7864 010. E500 - 5.0L 8 Cyl (32 Valve) MBZ Approval: 325.0 Concentrate. For distilled water see part # 55 7864 010. E500 - 5.0L 8 Cyl (24 Valve) MBZ Approval: 325.0 Concentrate. For distilled water see part # 55 7864 010. E500 4Matic - 5.0L 8 Cyl (24 Valve) MBZ Approval: 325.0 Concentrate. For distilled water see part # 55 7864 010. E500 4Matic - Wagon - 5.0L 8 Cyl (24 Valve) MBZ Approval: 325.0 Concentrate. For distilled water see part # 55 7864 010. E55 AMG - 5.5L 8 Cyl (24 Valve) MBZ Approval: 325.0 Concentrate. For distilled water see part # 55 7864 010. E55 AMG - Wagon - 5.5L 8 Cyl (24 Valve) MBZ Approval: 325.0 Concentrate. For distilled water see part # 55 7864 010. E550 - 5.5L 8 Cyl (32 Valve) MBZ Approval: 325.0 Concentrate. For distilled water see part # 55 7864 010. E550 4Matic - 5.5L 8 Cyl (32 Valve) MBZ Approval: 325.0 Concentrate. For distilled water see part # 55 7864 010. E550 - Coupe - 5.5L 8 Cyl (32 Valve) MBZ Approval: 325.0 Concentrate. For distilled water see part # 55 7864 010. E550 - Convertible - 5.5L 8 Cyl (32 Valve) MBZ Approval: 325.0 Concentrate. For distilled water see part # 55 7864 010. E550 - Convertible - 4.6L 8 Cyl (32 Valve) - Turbo MBZ Approval: 325.0 Concentrate. For distilled water see part # 55 7864 010. E550 - Coupe - 4.6L 8 Cyl (32 Valve) - Turbo MBZ Approval: 325.0 Concentrate. For distilled water see part # 55 7864 010. E550 4Matic - 4.6L 8 Cyl (32 Valve) - Turbo MBZ Approval: 325.0 Concentrate. For distilled water see part # 55 7864 010. E63 AMG - 6.3L 8 Cyl (32 Valve) MBZ Approval: 325.0 Concentrate. For distilled water see part # 55 7864 010. E63 AMG - Wagon - 6.3L 8 Cyl (32 Valve) MBZ Approval: 325.0 Concentrate. For distilled water see part # 55 7864 010. E63 AMG - 5.5L 8 Cyl (32 Valve) - Turbo MBZ Approval: 325.0 Concentrate. For distilled water see part # 55 7864 010. E63 AMG - Wagon - 5.5L 8 Cyl (32 Valve) - Turbo MBZ Approval: 325.0 Concentrate. For distilled water see part # 55 7864 010. E63 AMG 4Matic - 5.5L 8 Cyl (32 Valve) - Turbo MBZ Approval: 325.0 Concentrate. For distilled water see part # 55 7864 010. E63 AMG S 4Matic - 5.5L 8 Cyl (32 Valve) - Turbo MBZ Approval: 325.0 Concentrate. For distilled water see part # 55 7864 010. E63 AMG S 4Matic - Wagon - 5.5L 8 Cyl (32 Valve) - Turbo MBZ Approval: 325.0 Concentrate. For distilled water see part # 55 7864 010. G500 - 5.0L 8 Cyl (24 Valve) MBZ Approval: 325.0 Concentrate. For distilled water see part # 55 7864 010. G55 AMG - 5.5L 8 Cyl (24 Valve) MBZ Approval: 325.0 Concentrate. For distilled water see part # 55 7864 010. G550 - 5.5L 8 Cyl (32 Valve) MBZ Approval: 325.0 Concentrate. For distilled water see part # 55 7864 010. G63 AMG AWD - 5.5L 8 Cyl (32 Valve) - Turbo MBZ Approval: 325.0 Concentrate. For distilled water see part # 55 7864 010. GL320 CDI AWD - 3.0L 6 Cyl (24 Valve) - Turbo Diesel MBZ Approval: 325.0 Concentrate. For distilled water see part # 55 7864 010. GL320 Bluetec 4Matic - 3.0L 6 Cyl (24 Valve) - Turbo Diesel MBZ Approval: 325.0 Concentrate. For distilled water see part # 55 7864 010. GL350 Bluetec 4Matic - 3.0L 6 Cyl (24 Valve) - Turbo Diesel MBZ Approval: 325.0 Concentrate. For distilled water see part # 55 7864 010. GL450 AWD - 4.6L 8 Cyl (32 Valve) MBZ Approval: 325.0 Concentrate. For distilled water see part # 55 7864 010. GL450 AWD - 4.6L 8 Cyl (32 Valve) - Turbo MBZ Approval: 325.0 Concentrate. For distilled water see part # 55 7864 010. GL550 AWD - 5.5L 8 Cyl (32 Valve) MBZ Approval: 325.0 Concentrate. For distilled water see part # 55 7864 010. GL550 4Matic - 4.6L 8 Cyl (32 Valve) - Turbo MBZ Approval: 325.0 Concentrate. For distilled water see part # 55 7864 010. GL63 AMG AWD - 5.5L 8 Cyl (32 Valve) - Turbo MBZ Approval: 325.0 Concentrate. For distilled water see part # 55 7864 010. GLK250 Bluetec 4Matic - 2.1L 4 Cyl (16 Valve) - Turbo Diesel MBZ Approval: 325.0 Concentrate. For distilled water see part # 55 7864 010. GLK350 - 3.5L 6 Cyl (24 Valve) MBZ Approval: 325.0 Concentrate. For distilled water see part # 55 7864 010. GLK350 4Matic - 3.5L 6 Cyl (24 Valve) MBZ Approval: 325.0 Concentrate. For distilled water see part # 55 7864 010. ML320 - 3.2L 6 Cyl (18 Valve) MBZ Approval: 325.0 Concentrate. For distilled water see part # 55 7864 010. ML320 CDI AWD - 3.0L 6 Cyl (24 Valve) - Turbo Diesel MBZ Approval: 325.0 Concentrate. For distilled water see part # 55 7864 010. ML320 Bluetec 4Matic - 3.0L 6 Cyl (24 Valve) - Turbo Diesel MBZ Approval: 325.0 Concentrate. For distilled water see part # 55 7864 010. ML350 - 3.7L 6 Cyl (18 Valve) MBZ Approval: 325.0 Concentrate. For distilled water see part # 55 7864 010. ML350 4Matic - 3.5L 6 Cyl (24 Valve) MBZ Approval: 325.0 Concentrate. For distilled water see part # 55 7864 010. ML350 - 3.5L 6 Cyl (24 Valve) MBZ Approval: 325.0 Concentrate. For distilled water see part # 55 7864 010. ML350 Bluetec 4Matic - 3.0L 6 Cyl (24 Valve) - Turbo Diesel MBZ Approval: 325.0 Concentrate. For distilled water see part # 55 7864 010. ML430 - 4.3L 8 Cyl (24 Valve) MBZ Approval: 325.0 Concentrate. For distilled water see part # 55 7864 010. ML450 Hybrid 4Matic - 3.5L 6 Cyl (24 Valve) MBZ Approval: 325.0 Concentrate. For distilled water see part # 55 7864 010. ML500 - 5.0L 8 Cyl (24 Valve) MBZ Approval: 325.0 Concentrate. For distilled water see part # 55 7864 010. ML500 AWD - 5.0L 8 Cyl (24 Valve) MBZ Approval: 325.0 Concentrate. For distilled water see part # 55 7864 010. ML55 AMG - 5.5L 8 Cyl (24 Valve) MBZ Approval: 325.0 Concentrate. For distilled water see part # 55 7864 010. ML550 AWD - 5.5L 8 Cyl (32 Valve) MBZ Approval: 325.0 Concentrate. For distilled water see part # 55 7864 010. ML550 AWD - 4.6L 8 Cyl (32 Valve) - Turbo MBZ Approval: 325.0 Concentrate. For distilled water see part # 55 7864 010. ML63 AMG AWD - 6.3L 8 Cyl (32 Valve) MBZ Approval: 325.0 Concentrate. For distilled water see part # 55 7864 010. ML63 AMG AWD - 5.5L 8 Cyl (32 Valve) - Turbo MBZ Approval: 325.0 Concentrate. For distilled water see part # 55 7864 010. R320 CDI AWD - 3.0L 6 Cyl (24 Valve) - Turbo Diesel MBZ Approval: 325.0 Concentrate. For distilled water see part # 55 7864 010. R320 Bluetec AWD - 3.0L 6 Cyl (24 Valve) - Turbo Diesel MBZ Approval: 325.0 Concentrate. For distilled water see part # 55 7864 010. R350 4Matic - 3.5L 6 Cyl (24 Valve) MBZ Approval: 325.0 Concentrate. For distilled water see part # 55 7864 010. R350 - 3.5L 6 Cyl (24 Valve) MBZ Approval: 325.0 Concentrate. For distilled water see part # 55 7864 010. R350 Bluetec 4Matic - 3.0L 6 Cyl (24 Valve) - Turbo Diesel MBZ Approval: 325.0 Concentrate. For distilled water see part # 55 7864 010. R500 AWD - 5.0L 8 Cyl (24 Valve) MBZ Approval: 325.0 Concentrate. For distilled water see part # 55 7864 010. R63 AMG AWD - 6.3L 8 Cyl (32 Valve) MBZ Approval: 325.0 Concentrate. For distilled water see part # 55 7864 010. S320 LWB - 3.2L 6 Cyl (24 Valve) MBZ Approval: 325.0 Concentrate. For distilled water see part # 55 7864 010. S320 SWB - 3.2L 6 Cyl (24 Valve) MBZ Approval: 325.0 Concentrate. For distilled water see part # 55 7864 010. S350 - 3.4L 6 Cyl (12 Valve) - Turbo Diesel MBZ Approval: 325.0 Concentrate. For distilled water see part # 55 7864 010. S350 - 3.7L 6 Cyl (18 Valve) MBZ Approval: 325.0 Concentrate. For distilled water see part # 55 7864 010. S350 Bluetec 4Matic - 3.0L 6 Cyl (24 Valve) - Turbo Diesel MBZ Approval: 325.0 Concentrate. For distilled water see part # 55 7864 010. S400 Hybrid - 3.5L 6 Cyl (24 Valve) MBZ Approval: 325.0 Concentrate. For distilled water see part # 55 7864 010. S420 - 4.2L 8 Cyl (32 Valve) MBZ Approval: 325.0 Concentrate. For distilled water see part # 55 7864 010. S430 - 4.3L 8 Cyl (24 Valve) MBZ Approval: 325.0 Concentrate. For distilled water see part # 55 7864 010. S430 4Matic - 4.3L 8 Cyl (24 Valve) MBZ Approval: 325.0 Concentrate. For distilled water see part # 55 7864 010. S500 - 5.0L 8 Cyl (32 Valve) MBZ Approval: 325.0 Concentrate. For distilled water see part # 55 7864 010. S500 - Coupe - 5.0L 8 Cyl (32 Valve) MBZ Approval: 325.0 Concentrate. For distilled water see part # 55 7864 010. S500 - 5.0L 8 Cyl (24 Valve) MBZ Approval: 325.0 Concentrate. For distilled water see part # 55 7864 010. S500 Guard - 5.0L 8 Cyl (24 Valve) MBZ Approval: 325.0 Concentrate. For distilled water see part # 55 7864 010. S500 4Matic - 5.0L 8 Cyl (24 Valve) MBZ Approval: 325.0 Concentrate. For distilled water see part # 55 7864 010. S55 AMG - 5.5L 8 Cyl (24 Valve) MBZ Approval: 325.0 Concentrate. For distilled water see part # 55 7864 010. S55 AMG Kompressor - 5.5L 8 Cyl (24 Valve) MBZ Approval: 325.0 Concentrate. For distilled water see part # 55 7864 010. S550 - 5.5L 8 Cyl (32 Valve) MBZ Approval: 325.0 Concentrate. For distilled water see part # 55 7864 010. S550 4Matic - 5.5L 8 Cyl (32 Valve) MBZ Approval: 325.0 Concentrate. For distilled water see part # 55 7864 010. S550 - 4.6L 8 Cyl (32 Valve) - Turbo MBZ Approval: 325.0 Concentrate. For distilled water see part # 55 7864 010. S550 4Matic - 4.6L 8 Cyl (32 Valve) - Turbo MBZ Approval: 325.0 Concentrate. For distilled water see part # 55 7864 010. S600 - 6.0L 12 Cyl (48 Valve) MBZ Approval: 325.0 Concentrate. For distilled water see part # 55 7864 010. S600 - Coupe - 6.0L 12 Cyl (48 Valve) MBZ Approval: 325.0 Concentrate. For distilled water see part # 55 7864 010. S600 - 5.8L 12 Cyl (36 Valve) MBZ Approval: 325.0 Concentrate. For distilled water see part # 55 7864 010. S600 - 5.5L 12 Cyl (36 Valve) - Turbo MBZ Approval: 325.0 Concentrate. For distilled water see part # 55 7864 010. S63 AMG - 6.3L 8 Cyl (32 Valve) MBZ Approval: 325.0 Concentrate. For distilled water see part # 55 7864 010. S63 AMG - 5.5L 8 Cyl (32 Valve) - Turbo MBZ Approval: 325.0 Concentrate. For distilled water see part # 55 7864 010. S63 AMG AWD - 5.5L 8 Cyl (32 Valve) - Turbo MBZ Approval: 325.0 Concentrate. For distilled water see part # 55 7864 010. S65 AMG - 6.0L 12 Cyl (36 Valve) - Turbo MBZ Approval: 325.0 Concentrate. For distilled water see part # 55 7864 010. SL320 - 3.2L 6 Cyl (24 Valve) MBZ Approval: 325.0 Concentrate. For distilled water see part # 55 7864 010. SL500 - 5.0L 8 Cyl (32 Valve) MBZ Approval: 325.0 Concentrate. For distilled water see part # 55 7864 010. SL500 - 5.0L 8 Cyl (24 Valve) MBZ Approval: 325.0 Concentrate. For distilled water see part # 55 7864 010. SL55 AMG Kompressor - 5.5L 8 Cyl (24 Valve) MBZ Approval: 325.0 Concentrate. For distilled water see part # 55 7864 010. SL55 AMG - 5.5L 8 Cyl (24 Valve) MBZ Approval: 325.0 Concentrate. For distilled water see part # 55 7864 010. SL550 - 5.5L 8 Cyl (32 Valve) MBZ Approval: 325.0 Concentrate. For distilled water see part # 55 7864 010. SL550 - 4.6L 8 Cyl (32 Valve) - Turbo MBZ Approval: 325.0 Concentrate. For distilled water see part # 55 7864 010. SL600 - 6.0L 12 Cyl (48 Valve) MBZ Approval: 325.0 Concentrate. For distilled water see part # 55 7864 010. SL600 - 5.5L 12 Cyl (36 Valve) - Turbo MBZ Approval: 325.0 Concentrate. For distilled water see part # 55 7864 010. SL63 AMG - 6.3L 8 Cyl (32 Valve) MBZ Approval: 325.0 Concentrate. For distilled water see part # 55 7864 010. SL63 AMG - 5.5L 8 Cyl (32 Valve) - Turbo MBZ Approval: 325.0 Concentrate. For distilled water see part # 55 7864 010. SL65 AMG - 6.0L 12 Cyl (36 Valve) - Turbo MBZ Approval: 325.0 Concentrate. For distilled water see part # 55 7864 010. SLK230 Kompressor - 2.3L 4 Cyl (16 Valve) MBZ Approval: 325.0 Concentrate. For distilled water see part # 55 7864 010. SLK250 - 1.8L 4 Cyl (16 Valve) - Turbo MBZ Approval: 325.0 Concentrate. For distilled water see part # 55 7864 010. SLK280 - 3.0L 6 Cyl (24 Valve) MBZ Approval: 325.0 Concentrate. For distilled water see part # 55 7864 010. SLK300 - 3.0L 6 Cyl (24 Valve) MBZ Approval: 325.0 Concentrate. For distilled water see part # 55 7864 010. SLK32 AMG - 3.2L 6 Cyl (18 Valve) MBZ Approval: 325.0 Concentrate. For distilled water see part # 55 7864 010. SLK320 - 3.2L 6 Cyl (18 Valve) MBZ Approval: 325.0 Concentrate. For distilled water see part # 55 7864 010. SLK350 - 3.5L 6 Cyl (24 Valve) MBZ Approval: 325.0 Concentrate. For distilled water see part # 55 7864 010. SLK55 AMG - 5.5L 8 Cyl (24 Valve) MBZ Approval: 325.0 Concentrate. For distilled water see part # 55 7864 010. SLK55 AMG - 5.5L 8 Cyl (32 Valve) MBZ Approval: 325.0 Concentrate. For distilled water see part # 55 7864 010. Sprinter 2500 - 3.0L 6 Cyl (24 Valve) - Turbo Diesel MBZ Approval: 325.0 Concentrate. For distilled water see part # 55 7864 010. Sprinter 2500 - 2.1L 4 Cyl (16 Valve) - Turbo Diesel MBZ Approval: 325.0 Concentrate. For distilled water see part # 55 7864 010. Sprinter 3500 - 3.0L 6 Cyl (24 Valve) - Turbo Diesel MBZ Approval: 325.0 Concentrate. For distilled water see part # 55 7864 010. Sprinter 3500 - 2.1L 4 Cyl (16 Valve) - Turbo Diesel MBZ Approval: 325.0 Concentrate. For distilled water see part # 55 7864 010.
eEuroparts.com® proudly offers wholesale prices and fast shipping available on most orders. 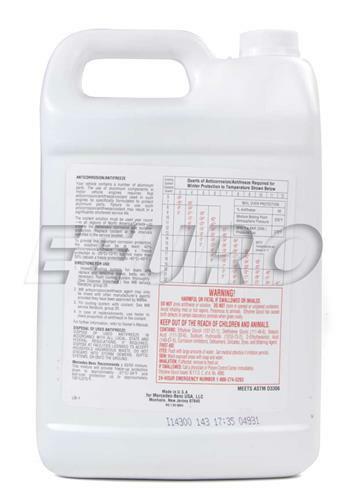 We also provide inexpensive and guaranteed 3 day, 2 day, and Overnight shipping options, so if you need your Engine Coolant Antifreeze (1 Gallon) tomorrow, eEuroparts.com® can deliver! Every eEuroparts.com® order is track-able, meaning you'll know exactly where your Engine Coolant Antifreeze (1 Gallon) is at every step of the shipping process. eEuroparts.com® also displays your Expected Ship Date and transit time in your Cart, making our entire shipping process simple and transparent.